3. Study of occlusal views. 4. 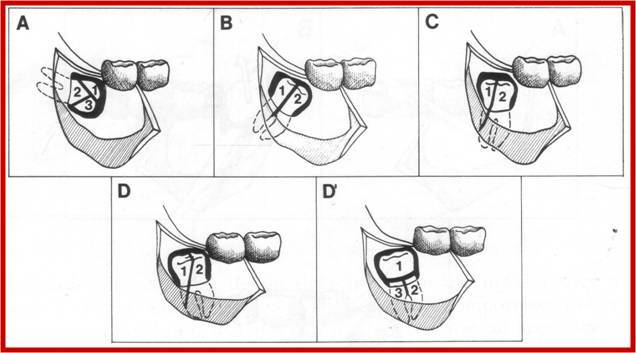 Relationship of roots to the inferior alveolar canal. 5. Examination of hard and soft tissues surrounding operative site. 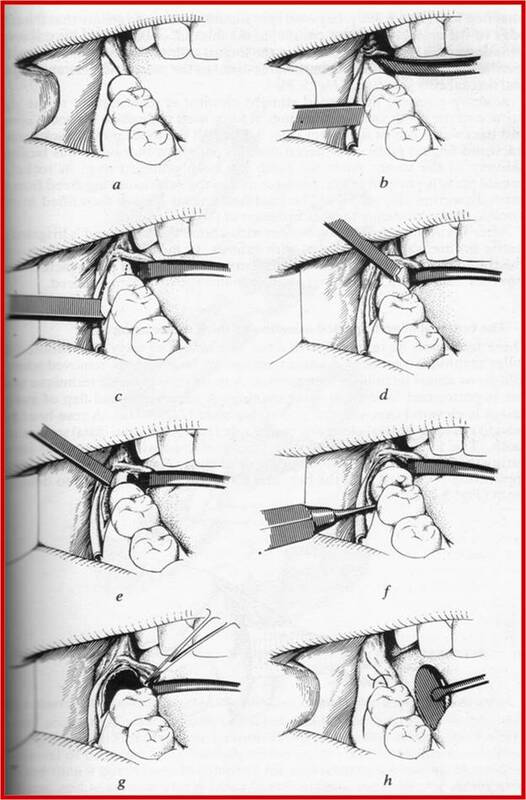 Local anesthesia / sedation + LA / GA.
Debridement and smoothening of bone margins. To gain access to the area. Visualize the overlying bone that must be removed. Flap be large enough for adequate access and visibility of surgical site. Broad base – wider than the margin. Incision must be made with smooth stroke of the scalpel which is kept in contact with bone throughout the entire incision. 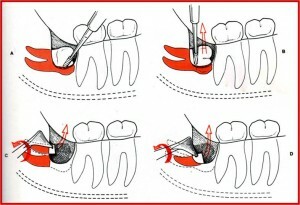 Incision should be closed over solid bone rather than over a bony defect. Should avoid vital anatomic structures. Only a single releasing incision should be used. Reflected laterally to approximately the external oblique ridge with periosteal elevator. 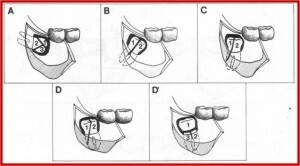 Retractor: Austin and Minnesota retractor. Placed on buccal shelf just at the external oblique ridge. 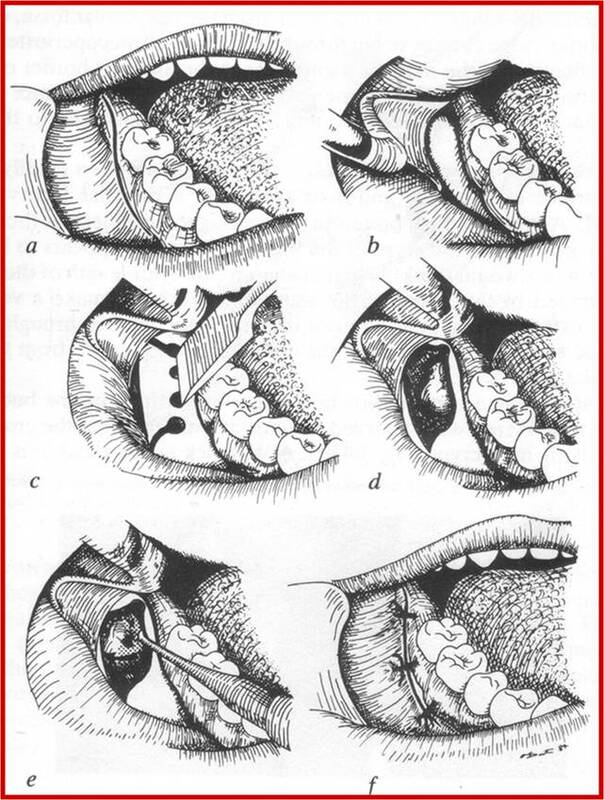 After buccal flap has been elevated lingual soft tissue should be reflected. 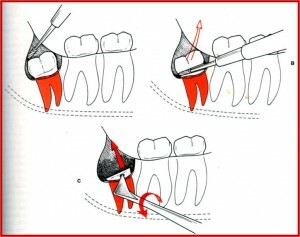 To expose the crown by removing the bone overlying it. 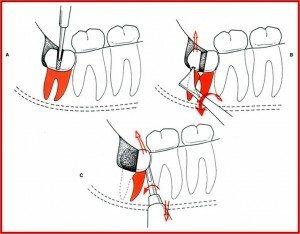 To remove the bone obstructing the pathway for removal of a tooth. How much bone is to be removed? Adequate amount of bone should be removed to enable for elevation. High speed, high torque handpiece and bur technique. No. 7/ 8 round bur or a straight no. 703 fissure bur is used. Bone on occlusal aspect and on the buccal and distal aspect down to the cervical line of the impacted tooth should be removed initially. 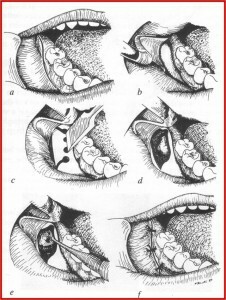 The cortical bone on the buccal aspect of the tooth is removed down to the cervical line. Bur can be used to remove bone between the tooth and the cortical bone in the cancellous area of the bone called ditching. Less bone necrosis than bur technique. Can cause inadvertent fracture of the bone. 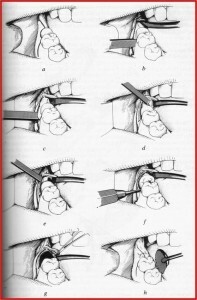 The jaw bone should be supported while using this technique. The split-bone technique of Sir William Kelsey Fry. Later popularized by T. Ward. Creates saucerization of the socket, thereby reduces the size of the residual blood clot. Used for mandibular third molar removal, especially those which are placed lingually. Elimination of distolingual bone reduces the incidence of postop complication caused by large dead space created when socket walls are retained intact. 2. 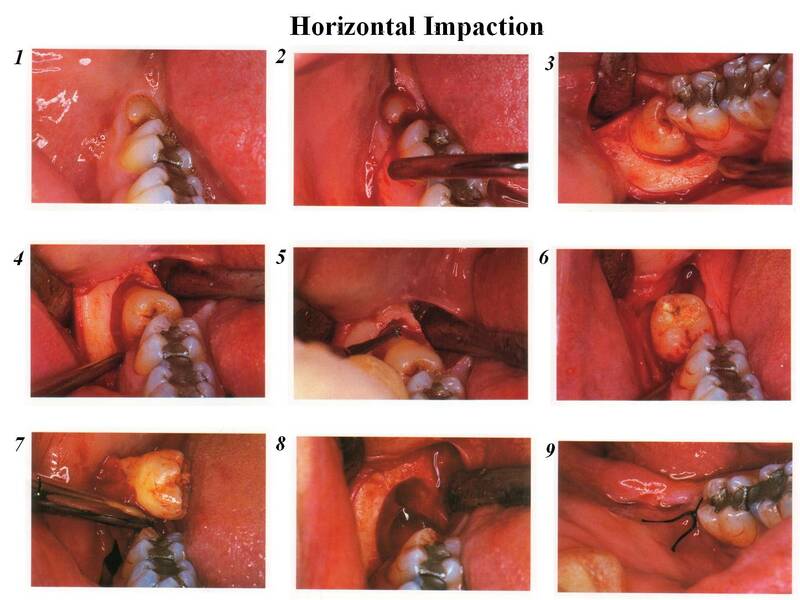 Removal of an impacted mandibular third molar using bur. 3. 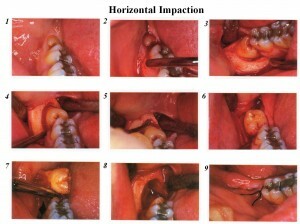 Removal of impacted mandibular third molar using tooth division. 4. Lateral trepanation technique of Bowdler Henry. To remove any partially formed unerupted third molar. Bone healing is excellent and no loss of alveolar bone around second molar. Reduces the amount of bone removal. Reduces the risk of damage to the neighboring teeth. 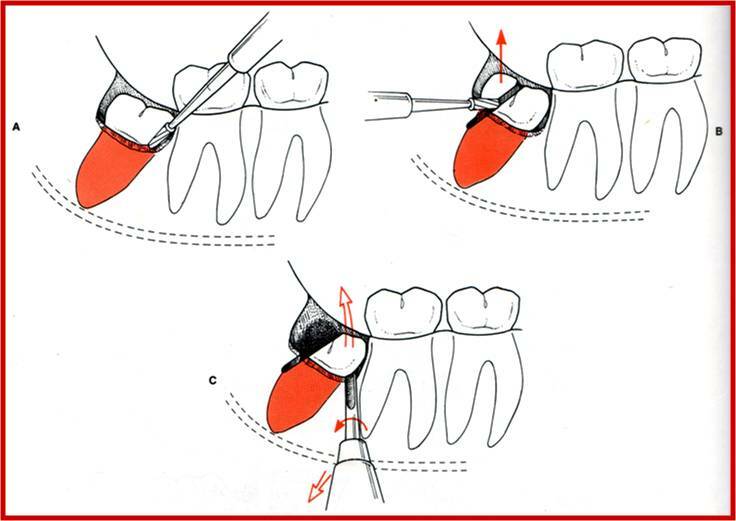 Planned sectioning permits the parts of the tooth to be removed separately in an atraumatic manner. 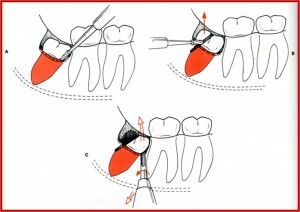 Dependent on angulation of the impacted tooth. Bur used in a controlled fashion to avoid damage to vital structure. Sectioned one half to three-fourths with the bur and the completed sectioned with the elevator. Curetting to remove any remaining dental follicle and epithelium. Look for pieces of coronal portion (especially in carious teeth/ sectioned teeth), check for remnants of bone / granulation tissue, bleeding points. Check for caries of adjacent tooth. Round of the margins of the socket. 3-0 black silk is used. Interrupted sutures given and maintained for 7 days. 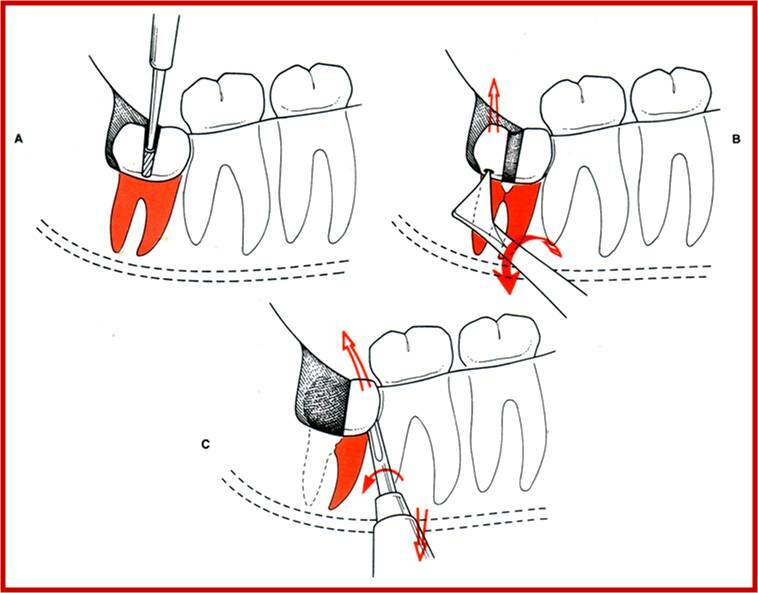 In case of molars, suture distal to second molar should be placed first and should be water tight to prevent pocket formation.